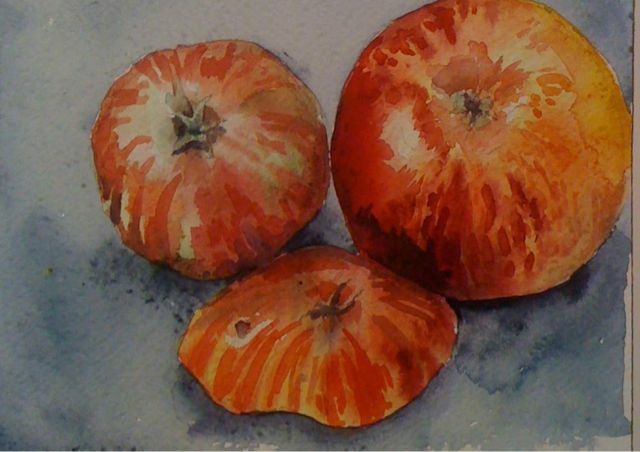 Today I have painted the bottoms of two different kinds of apples. They have both been identified as Ellison’s Orange by experts at an apple day, possibly different experts as the largest apple was identified two years ago. The other, from the community orchard, was ID’d last weekend. The smaller apple and the cut piece both show two differences. They have more distinct stripes and they have long sepals which reflex out in a little star shape. The other apple has short stumpy downy sepals. The sepals are the remains of the covering of the flower when it is in bud. I believe that the very pronounced stripes and the sepals point to it apple being Allington Pippin. It does not taste quite the same as the Ellisons Orange ,which incidentally is a dead ringer for the illustrations of the variety. It just goes to show that there are so many factors that have to be considered when doing an ID that it is no wonder there are and always have been many cases of mistaken identity in the apple world. But since writing this I have found some really clear pictures for Allington Pippin and they are nothing like the striped apple. There are pictures of Allington Pippin out there with lovelylong stripes but the ones in the National Fruit Collection are not striped, think again next year, the last of the apples are rotting on the ground so there’s little option. Yesterday I drove a mammoth triangle taking in London Surrey, Hampshire and back to Sussex. I finished my bit of guerrilla gardening at my aunt’s house and got back home after dropping off my former neighbours knitting bag with her niece! She has such a sweet garden, even in the dusk I could see that the balls of box were perfect and the textures were varied but harmonious. I knew I had found the right house when I saw the pot of bamboo by the front door. Because her bamboo is so invasive she keeps it all in pots, it is still over two metres high and makes a good screen…which can be moved at will. It has actually rained I forgot to check how much rain but it looked like a good bit over several hours. Dock seedlings now lift out of the wet soil with just a tug. I was being a complete degenerate and was slumped over the kitchen table doing the Suduko before I had read the news…..then a tall Swede turned up on the doorstep with a large bamboo in a pot. He says it is very invasive but what it is is now unknown. We will put it behind the rhizome barrier and let it romp with the golden bamboo and the Geneva( unknown species) bamboo and the Clerodendron bungii which I bought from Fergus Garrett when he visited the Horticultural Society to give a talk about Great Dixter. It even stopped raining long enough to go round the garden with a cup of coffee with him. Lovely unexpected visit and present, husband was very keen to show off his rhizome barrier and associated bee colony. Incidentally none of the bamboo seed bought from Germany germinated despite a heated propagator and plenty of humidity. This means that we will need to find some other things to fill the back of the rhizome barrier area. We do still have a voucher for Architectural Plants so perhaps a trip over there is the way to go. It’s one of my favourite nurseries as they grow the plants and know what will work…for instance when I asked for a Strawberry tree(Arbutus) they said” Where do you live?” When I told them they replied “It will die in your clay! Let’s find something that will survive.” We bought a large specimen of Osmanthus yunnanensis instead, which is making a neat lollypop shaped tree at the far end of the side garden. Eventually it will give a little evergreen screening from the houses on the main road. This tree was probably the single biggest investment in the garden apart from fences and hedges but it has a quiet classic charm all of its own and scented flowers in February. 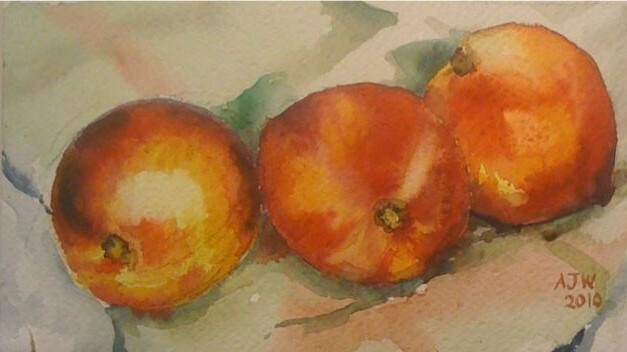 There are three little peaches in today’s painting, just a simple still life.